Mob Boss: The Life of Little Al D'Arco, The Man Who Brought Down The Mafia, the sizzling hot new book by Jerry Capeci and Tom Robbins is available at bookstores everywhere. It's also available online at Amazon.com and Barnes & Noble now for much less than the $27.99 list price. You can also get it from Apple, from BooksAMillion, as well as an independent book seller near you. D'Arco was the first acting Mafia boss to cooperate when he flipped in 1991. His testimony helped send more than 50 mob figures to prison, and his decision to defect prompted many others to follow his lead, including then-Gambino family underboss, Sammy Bull Gravano. You can tour the tough streets near the Brooklyn Navy Yard where Al D'Arco was raised, and follow him through the Mafia social clubs of Little Italy and south Brooklyn on this special google map of Al D'Arco's New York. Jerry Capeci stopped in to talk with WBGO's award winning radio commentator Allan Wolper about covering mob funerals, Mob Boss, midnight phone calls from Bruce Cutler, and the world of organized crime. Check out the special edition of Conversations With Allan Wolper. Listen to Brian Lehrer's public radio interview of Jerry Capeci and Tom Robbins about Mob Boss, their sizzling hot new book about Alfonso (Little Al) D'Arco, through this online link. They discuss D'Arco's value as a government witness, his reasons for defecting from the Mafia, and the status of the new, emerging ethnic crime groups. The New York Times review says Mob Boss is a "gripping, novelistic biography ... a bulls-eye." Co-authors Jerry Capeci and Tom Robbins spent an hour chatting with Guardian Angels founder Curtis Sliwa about Little Al and a host of other topics, including John A. Gotti, the erstwhile Junior Don whom the outspoken radio talk show host would like to see go to hell without an asbestos suit for allegedly ordering Sliwa's shooting during a taxi cab ride from hell back in 1992. A few days before legendary WOR radio personality John Gambling announced that he was retiring after 27 years on the air, he and Jerry Capeci talked about the life and times of Little Al D'Arco and the immense impact his decision to flip had on the world of organized crime. Listen to two radio reports about Mob Boss and Little Al D'Arco by 1010 WINS investigative reporter Juliet Papa. Check out the walk-talk through Little Al's old haunts in Little Italy that Wall Street Journal columnnist Ralph Gardner took with co-authors Capeci and Robbins. If you were in Little Italy in early October, you could have snagged an autographed copy at McNally Jackson, at 52 Prince Street, across the street from where Little Al used to enjoy pasta e fagiole at Ray's Pizza, and a few blocks from where he ran his own four star restaurant on Cleveland Place. "Just a superb book," says Pete Hamill. "A genuinely great mob story about a genuine New York gangster by two of the city's best reporters," says Jimmy Breslin. Read more about Mob Boss in the Village Voice, or in two Mob Boss excerpts that ran in the New York Post, including one about Ray's Pizza, where much more than pies were on the menu. By popular demand, Alpha Books has distributed a special millennium edition of The Complete Idiot's Guide to The Mafia, Second Edition to the nation's bookstores. It's much more than a revised edition of the 343-page best selling book that Alpha published in 2001. Rather than scrunch the new book into the same size as the original, Alpha commissioned me to retain the original 26 chapters — editing and updating them with newly acquired information — and add an entire New Millennium section of seven new chapters to create a monster 444 page book. It retails at the same list price of the first edition, $18.95. Real stuff about real wiseguys and insight about the ways that mobsters make their money. True stories of life and death, honor and betrayal with a foreword by award-winning author George Anastasia. Get it at your local bookstore, or at Amazon.com, or at Barnes & Noble. 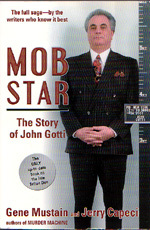 Mob Star: The Story of John Gotti — the book it took yours truly and Gene Mustain 17 years to do — tells the complete saga of John Gotti, from his treacherous rise to his defiant downfall. Although we didn't know it at the time, we began working on Mob Star in 1985, when we began covering the Gotti story as news reporters. 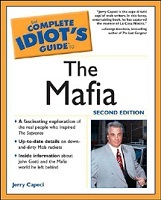 The first edition came out in 1988, and we finished this new edition three days before Gotti died in June 2002. We added a postscript, and with a 40,000-word update, the new edition contains the entire Gotti saga right up to his time in prison and his death from throat cancer. The 378 page, full-size book uses eight additional chapters, a prologue and an epilogue to complete the story we began telling (better than any other reporters, we might add!) when we covered the Gotti-orchestrated, midtown Manhattan assassination of former Gambino boss Paul Castellano. It is available at book stores everywhere, and online at Amazon.com and at Barnes & Noble. Murder Machine: A True Story of Murder, Madness, and the Mafia, the second book by Gene Mustain and Jerry Capeci, was published in 1992. It was hailed by Pete Hamill, Pulitzer Prize winning columnists Murray Kempton and Mike McAlary, New York Daily News columnist Gail Collins and Nick Pileggi, author of Wiseguy and Casino. Murder Machine is an insider's account - buttressed by hundreds of interviews and half a million pages of documents — of a Mafia crew of car thieves and drug dealers that claimed 200 victims in a 10 year period. Headed by Gambino crime family capo Anthony (Nino) Gaggi, the crew had five serial killers among its members, including Gambino mobster Roy DeMeo (right). At the time Gambino boss Paul Castellano was executed, he was on trial with three of the killers, who were all subsequently convicted and are now serving life terms. Murder Machine is available at your local bookstore for $7.99, or online at Amazon.com, or at Barnes & Noble. "This is the scariest book I've ever read about the mob," said Hamill. "We've heard tales about professional killers and tales of solitary serial killers. But this is the tale of a complete gang of serial killers. They maimed. They tortured. They slaughtered. And they enjoyed it. After this, nobody can ever write another Mafia romance." Said McAlary: "You'll be ducking for cover on every page. In Murder Machine, they reveal the story of a single Brooklyn gang that killed more Americans than the Iraqi army." Said Collins: "Nobody knows the mob like Jerry Capeci and Gene Mustain, and in Murder Machine, they've got the most amazing wiseguy story yet. It's the saga of a crew of serial killers run amok, a cross between the Godfather and Texas Chainsaw Massacre." GOTTI: Rise and Fall shows John Gotti to be a ruthless manipulator, a Machiavellian master of intrigue and the double cross — and an ardent womanizer. His rise to the head of one of America's most powerful crime family was marked by corpses, lies and betrayals. In GOTTI: Rise and Fall we use FBI tapes of Gotti and his cohorts, thousands of documents, and a host of sources on both sides of the law to tell the whole uncensored story of John Gotti, who still runs the powerful Gambino crime family from a maximum security federal prison cell in Marion, Illinois. Your local bookstore has it for $7.99. You can also get it online at Amazon.com or at Barnes & Noble. GOTTI: Rise and Fall also tells the story of Salvatore (Sammy Bull) Gravano, (right) an equally violent mobster who was at Gotti's right hand from the night Castellano was killed until Gravano made a deal with the FBI and federal prosecutors in Brooklyn and became the first Mafia underboss to testify against his boss. Read about Gravano's first crime at the age of eight, his induction into the Gambino crime family, and of the 19 gangland style slayings he was involved in from his first on Feb. 28, 1970 until his last on Oct. 4, 1990. Read about his dramatic courtroom confrontation with Gotti and how Gotti's pals did their damnedest to rattle him on the witness stand. GOTTI will also take you into the prison cell that Gotti and Gravano shared after their arrest on Dec. 11, 1990. Read about the jailhouse confrontation between the two men after Gravano learned from an FBI tape recording that Gotti had been badmouthing him behind his back. And read how Gotti revealed in that confrontation that it wasn't the first time he had talked behind Gravano's back, and how that played in Gravano's decision to turn on his boss. GOTTI will take you into the Dapper Don's downtown Manhattan headquarters, the Ravenite Social club, where, under pictures of himself and his mentor, long time family underboss Neil Dellacroce, Gotti held court, and into a widow's apartment two flights up where Gotti held meetings he thought were secret with Sammy Bull Gravano and Frank LoCascio. GOTTI: Rise and Fall also reveals how the Gambino family boss was betrayed by two trusted capos, Daniel Marino (left) and James (Jimmy Brown) Failla (right). The duo had been part of the Castellano wing of the family, but both became part of Gotti's inner circle as the Dapper Don moved to consolidate his power. Unbeknownst to Gotti, however, both joined in a plot by rival Mafia boss Vincent (Chin) Gigante to avenge Castellano's killing by assassinating Gotti and placing Marino and Failla atop the Gambino crime family. Read the first account of Gotti's relationship with model Lisa Gastineau, ex-wife of former New York Jets former All Pro defensive end Mark Gastineau, and how they were planning to celebrate her 30th birthday by attending Frank Sinatra's 75th birthday concert the night Gotti was pinched in the case that finally brought him down. And much, much more. Also see The HBO Original Movie, based on our book. Sometimes they're frightening, other times they're funny, and often they're full of themselves. In Wiseguys Say The Darndest Things, The Quotable Mafia, you'll get the darnedest words from scores of wiseguys and people who loved, hated, feared or respected them. In the 273-page book, you'll read what mob guys say about their lawyers, celebrities, and why it's dangerous to drive on Monday and Thursday mornings. You'll read what wiseguys from all over the country have to say about bugs, wiretaps, and how to recover from emotional stress. 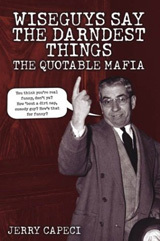 Culled from tape recordings, court testimony, FBI documents, books interviews, and other sources, you'll read what wiseguys — for this book's purposes, the term refers to gangsters of all ethnic persuasions — have to say about television, the movies, and just about everything else that they, and normal people talk about in their daily routine. You'll get the inside dope on loansharking, extortion, murder, the law, and the media from Al Capone of Chicago, Dutch Schultz of New York, Santo Trafficante of Tampa, Whitey Bulger of Boston, and many more. The book's 22-page long "Cast of Characters" contains thumbnail descriptions of gangsters from Joe Batters Accardo to Bayonne Joe Zicarelli. It's a bargain at the $14.95 list price but you can get for much less online at Amazon.com or at Barnes & Noble. The best of Gang Land is available in a book store near you. 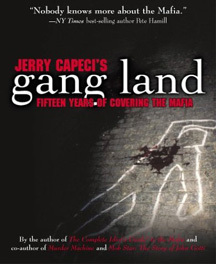 Or you can pick up a copy of JERRY CAPECI'S Gang Land: Fifteen Years Of Covering The Mafia at a special low price from the Godfather of online booksellers, Amazon.com. The 330-page oversized book includes an index and eight pages of photographs. It is sure to contain a few of your favorite columns, as well as some you may have missed during Gang Land's lengthy run that began in 1989 in The New York Daily News, ran for a time in The New York Sun, and continues online today. The book's 125 columns chronicle the New York Mafia landscape from John Gotti's heyday in 1989 as the swashbuckling Dapper Don to the remarkable day in 2003 when Gotti's longtime rival Vincent (Chin) Gigante gave up his Daffy Don routine and confessed to having put on a crazy act for three decades.